Ah yes it is indeed that time of year again. Soon the school bus will be driving by, homes will be a bit quieter, and another school year will have started. Well, unless you home school. In our case we home school and we homestead, so we have a pretty busy September coming up. Not to mention the show pig side of things. This week we will be heading up to the state fair, then down to the National Barrow show in two weeks, we have to finish getting our garden harvested, and of course our first day of school is next week! No time to fret though, my lessons are planned and I am working hard this week to keep up with the garden in hopes of wrapping up a few of our produce items. So here we go ready, set, school! I know that Tractor Man is going to have some issues with this new idea of full time school. Right now he thinks he can pretty much do whatever he wants. To be honest basically he does aside from his required chores list. So how will I prepare him for this new life change? First, I got him excited. We picked our supplies a few weeks ago when things came on sale and I had coupons. He honestly does not require much being only four years old. Home school means we have no need for a back pack, brand new clothes, or any of the other first day purchases that are usually made. Secondly, I got my lesson plans together. I have been working on those for a little over a month or two now so it makes me feel good to know they are ready to go. I also got lessons or ideas planned out for Tag Along,which means less need to think of ways to distract him while I’m trying to teach. Next, I prepared the “school area” and pre-made a few breakfast items. I do not plan to pre-cook breakfast very often but I figure the first week will be hard enough. 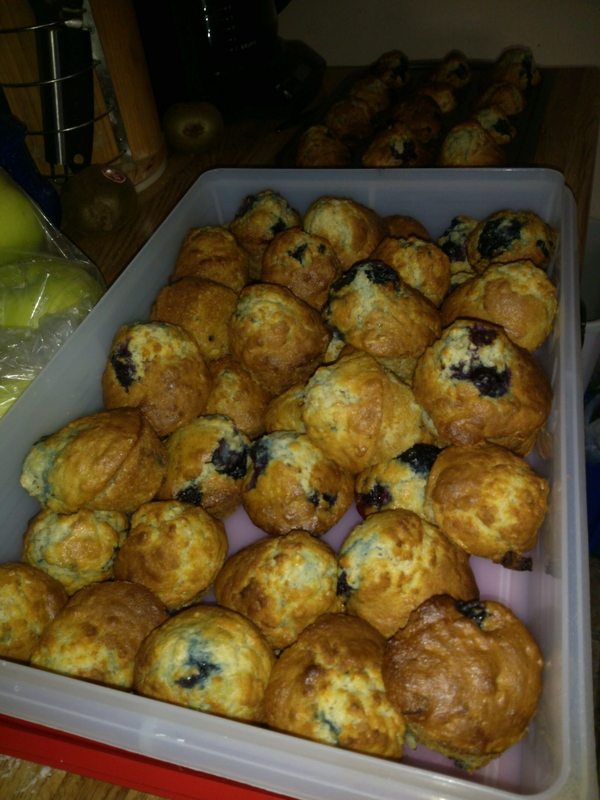 Blueberry muffins, pancakes, apple cinnamon muffins and a few snacks should help us to get off to a smooth start. Finally, my focus must turn to keeping Tractor Man on a schedule. This is the part that I dread. I grew up a child of schedules and I know how it makes me feel to this day when a list of obligations is placed before me. For Tractor Man I have based his schedure around four twenty minute sessions of sit down learning time. These sessions are for math, reading, writing, and natural science (nature, animals, etc.). I also have a science experiment time, reading time, and of course play time listed but those are for after my key four focus areas. My biggest challenge with Tractor Man’s schedule will be his sleeping habits. My husband and I often joke that we created hybrid babies that require no sleep. I know that sounds crazy but please let me give you our most recent example. In an effort to prepare for school we are trying to put the boys down for bed earlier. Tag Along has chosen on his own to take quiet time and not a nap anymore (sad I know). So for the past three days he has had no nap and goes to bed at 8:30pm which is amazing! Until today when he was WIDE awake at 4am. I tried to keep him in bed, let him snuggle, no talking, etc. but at 5am I gave up. He was talking and wiggling around so much he was waking up the rest of the family. Like I said they just do not need sleep. So, we will be pushing Tractor Man to get more rest and hoping that Tag Along will do just that and tag along. With so much to do it is a wonder we choose to home school at all. The key is to take it day by day and just adjust to your new chapter in life. It will be full of sleepless challenges, math problems and stubborn “I won’t read” moments but you will prevail. Everyday they are learning a little bit more, and so are you. At least I know that I am. I know that the start to the school year will be a challenge for us all but I am truly looking forward to it. I hope that you are too and that maybe you are able to be a little more ready for your first day of schoool too. Happy homeschooling everyone. Now get ready, set, school!! !